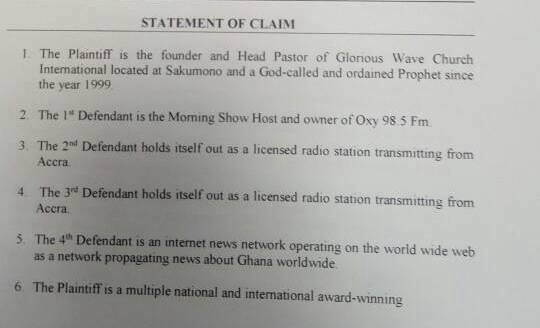 Founder and leader of Glorious Wave Church International Prophet Emmanuel Badu Kobi has sue CEO of OXY FM, OXY FM, Rainbow FM and Ghanaweb for publishing false stories about the noble servant of God. Mr. Alfred Kwame Larbi popularly known as DJ OXY is known to be a controversial radio broadcast journalist. 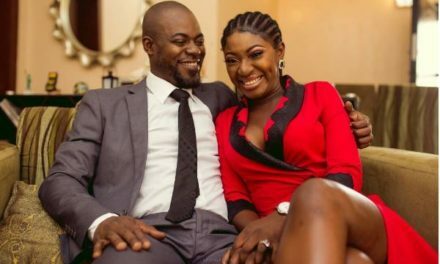 In recent times the self acclaimed broadcaster rained insults just to destroy His churches image in several radio interviews and also published false stories about Prophet Emmanuel Badu Kobi. In an interview on Rainbow Radio Mr Alfred Kwame Larbi claimed that Prophet Emmanuel Badu Kobi gave him a photograph of a man with a striking resemblance to president Nana Addo Dankwa Akuffo. 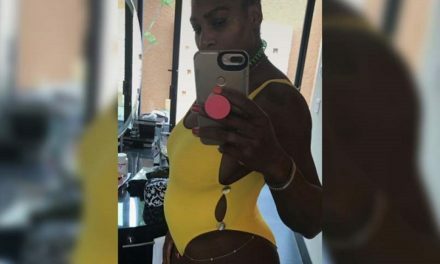 Mr Alfred Kwame Larbi claimed the purpose was to publicly say that the man in the photograph is an illegitimate son of president Nana Addo Dankwa Akuffo. 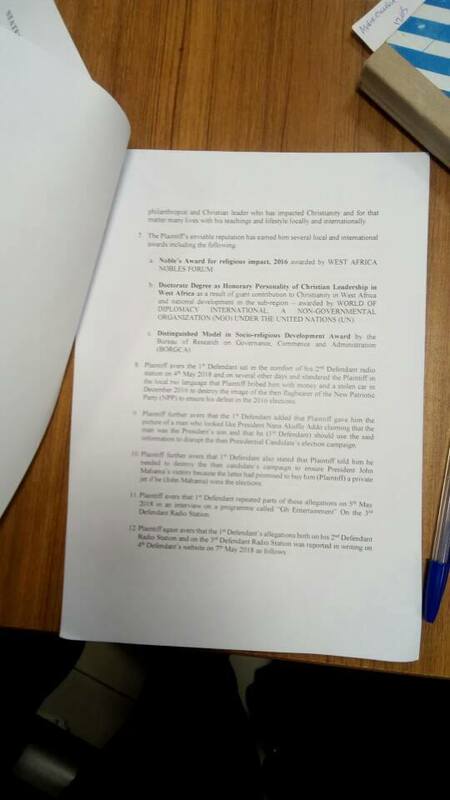 Mr Alfred Kwame Larbi claimed this was in exchange for favors including a private jet from ex president John Dramani Mahama. It turns out all these claims by Mr Alfred Kwame Larbi (DJ OXY) leveled against Prophet Emmanuel Badu Kobi are wholly fallacious. Prophet Emmanuel Badu Kobi assures Ghanaians there is no iota of truth in Mr Alfred’s claims. 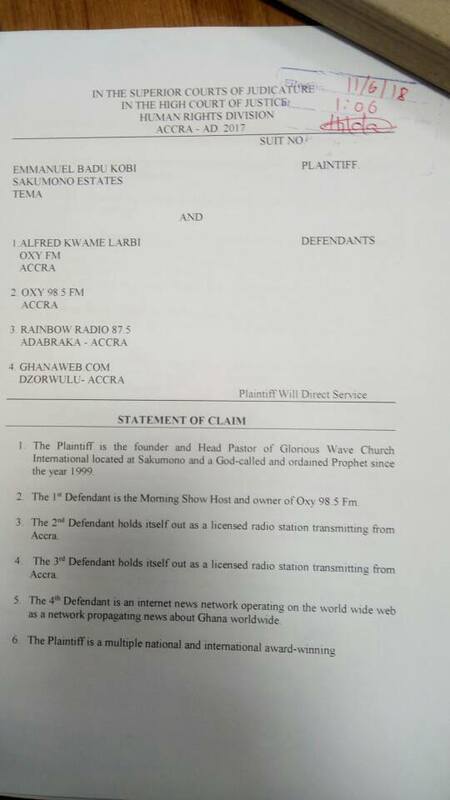 However Mr Alfred Kwame Larbi (DJ OXY has been sued by Prophet Emmanuel Badu Kobi and has already been served with a Writ of Summon by Accra High Court of Justice. 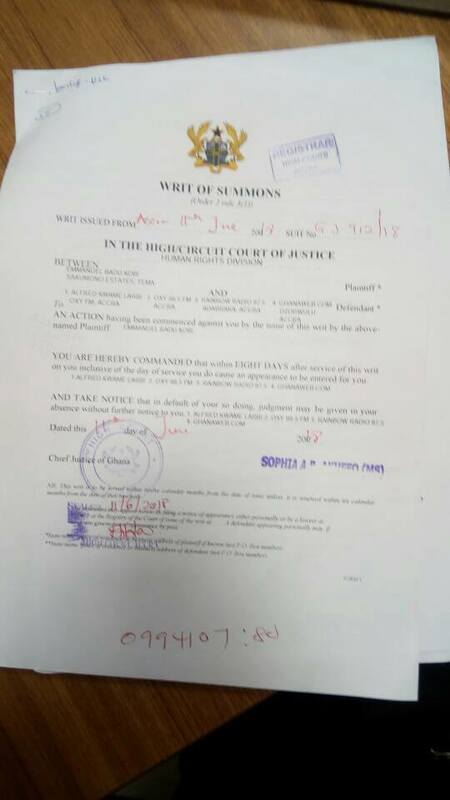 Find below images of the writ of summons being giving to DJ OXY.